Something has been bothering me about the presidential polls. Well, a lot of things. But one in particular has stirred up my mathematical senses. President Obama has been ahead in a enough states to give him a wide electoral vote victory, but the popular vote across the country has been close. For these reasons, the punditocracy has been concern trolling about a possible disparity in the election between an electoral vote victory for Obama and a popular vote victory for Romney. Here’s one example. The margins by which Obama has been ahead have ranged from small, say 51-49, to as much as ten points. My mathematics says that, in order for the popular vote to be close, there have to be some big margins for Romney in a few states. But where? The media , for the most part, haven’t said. Last week, Kevin Drum provided the answer. 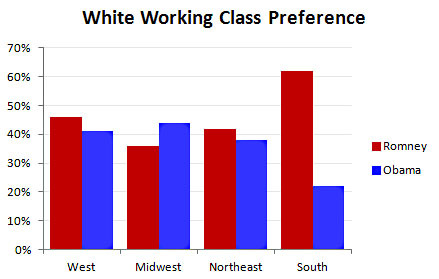 He was talking about the white working class vote in particular, but I’ll bet the overall margins reflect these numbers. It was much the same in 2008: Democrats are going extinct as national elected officals in the South, white as well as black; it’s not just Obama’s race, but that hardly can be a positive in that region. There is very little about this enormous regional disparity in the national press. You can find it if you search hard enough*, but the preferred media narrative is of the possible electoral-popular split. That’s a both-sides kind of story: Bush and now Obama. Nothing to see here. But when so much of that popular vote margin is concentrated in so few states, the electoral college begins to make a bit more sense. It’s too bad that the South still has not come to terms with the outcome of the Civil War. It’s too bad that one section of the country is so badly out of step with the rest of the country, and the rest of the world. This is where much of the anti-science, the refusal to support public schools, the fear of immigrants is centered as well. It’s too bad that the media won’t recognize this disparity. They’re acting as though the South is our electoral equivalent of the crazy uncle in the attic. But most of us don’t treat our crazy uncles that way any more, either. *Thanks to Steve Hynd at The Agonist for help with this on a busy day. It is also the Bible belt, so that everything is seen through a cultural rather than class prism. And the Baptists preach free market, anti-union fundamentalism (against the godless commies). I lived in North Carolina long enough to see the bizarre mixture of over-wrought resentment, inferiority complex, sentimentality and pride. And Faulkner's darkness.